Hurricane Hart Lands at Multiple Media Outlets to Tell Her Story. CFN – Today if you make the rounds in Cornwall media there is a respite from Rob Ford stories as South Stormont Deputy Mayor Tammy Hart has contacted area media and tried to get ahead of a report that was tabled to come out on the November 27th meeting of her council. Ms Hart was spanked in that report like a naughty child. 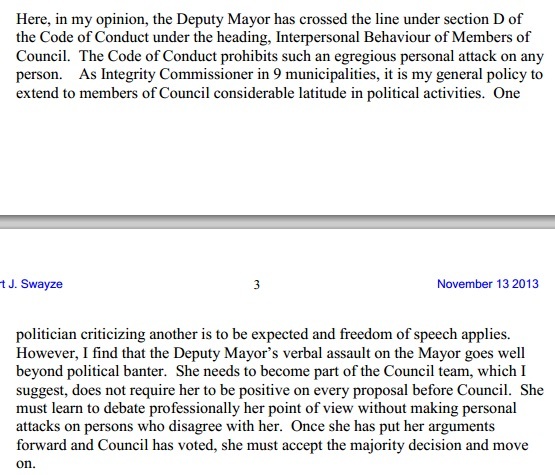 She complains about the cost of the services of the integrity commissioner but what was her council’s options in light of her public statements and actions in and out of camera? Ms Hart gave a radio interview to Corus Radio in Cornwall. In the name of Transparency which seems to be tantamount to Ms Hart we are releasing the Report from Mr. Swayze. If you read that and then listen to some of Ms Hart’s clips and interviews to get ahead of the report it really feels odd? After all why is she chastising Mr. Swayze if he in fact did not suspend or penalize her? What did she expect in light of what she herself has admitted to? 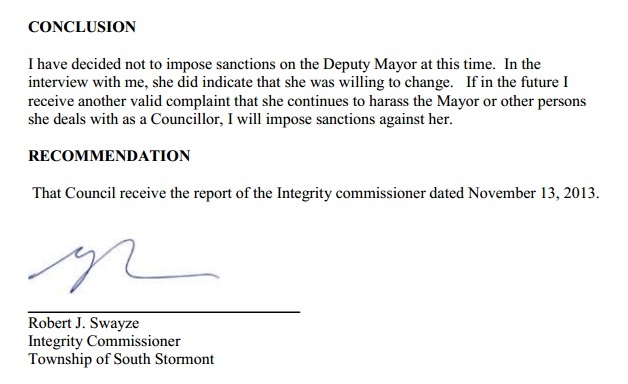 As for the cost to the Township shouldn’t she have to reimburse South Stormont when the Investigator has clearly found in favour against her? 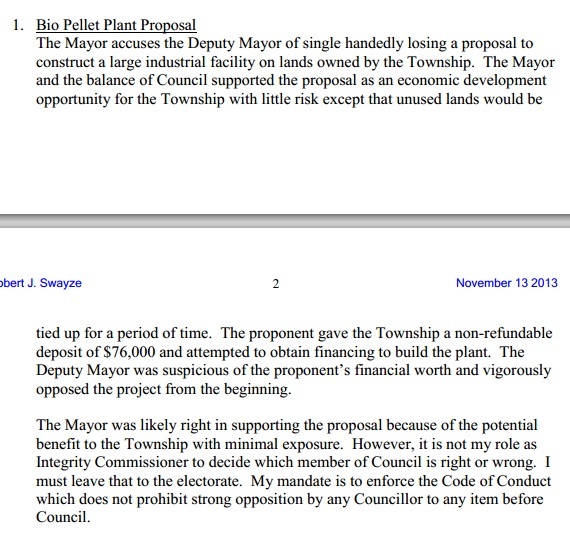 Isn’t her actions; the ones she laments the cause of the Township having to go to the degree of bringing in Mr. Swayze? While it’s important to stand for one’s principle’s and transparency and accountability are crucial in this day and age is this really about those issues or does Deputy Mayor Hart have some issues to deal with herself? While there may be a need for Transparency and Accountability in South Stormont it might need to be focused on the Deputy Mayor rather than her council. What we seem to have here is someone who upon hearing of a damaging report tried to get some spin and traction to message the story in her favour? 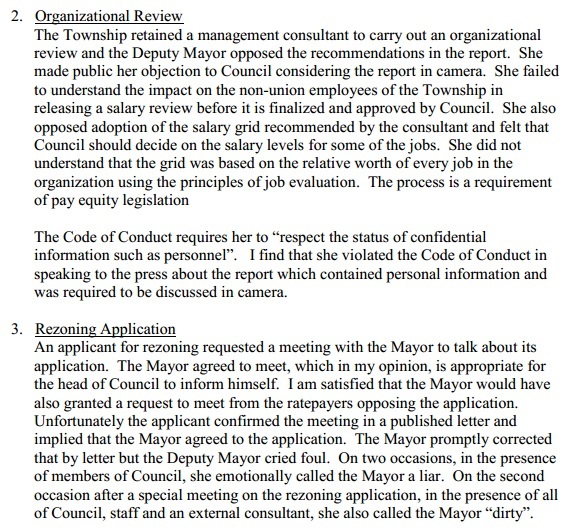 Someone who in spite of reading the report that gave her a near free pass with the proviso of not essentially lashing out and accepting results, ran out, leaked the report out before other councilors had read it and violated the trust of her council. Ms. Hart definitely has some personal issues to deal with, herself. That has been obvious for quite some time. What would it be like if all politicians behaved in the fashion she does? The Integrity Commissioner was very kind to her. What would it be like if he had reviewed all of her activities? She said she could change but what does she do? Tammy Nation must be getting fired up in South Stormont by now. Hey, I’ve made mistakes… Nobody’s perfect… I’m moving forward… I have a trainer… I’m going to be nicer…. Ya know what?… I can’t take back the past… You might be perfect… but I’m not…. You just wait… There’s only one Tammy Hart… I’ll show you… This means war! I basically agree with your observations Furtz. Perhaps this poor wannabee politician is suffering from a form of big head syndrome. Whatever her problem is, next term she will likely have all the time in the world to get help. Sooner if she has the wherewithal to call it a day and do the right thing and resign with what little dignity she has still intact. Too bad the most recent comments feature is no more. Makes it pretty much impossible to follow discussions. It’s still on the home page Furtz. Editor’s note to author – please note length of excerpts, especially from media we are currently in litigation with. If you can respect or tolerate elected officials that lack integrity, etc, knock yourself out. 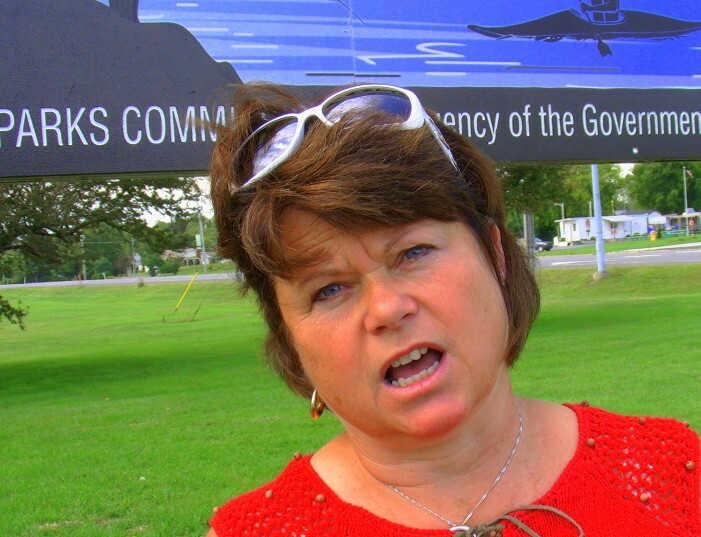 Another Conservative politician melt down perhaps? Sure is dead around here lately. 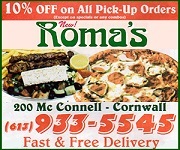 No letters from Timmins? Furtz………I am feeling very lonely lately. There are three people that I truly miss. My life feels empty without them.. Hoping that they are well and that they are still fighting for all Canadians. Hang in there Stella. They’re probably just catching their breath and regrouping for the next onslaught. Good to know you’re still alive and kicking, Kilroy. I was a little concerned about your bile pressure levels. It’s never good to let it build up too much.